“War and Peace” in my bicycle helmet one summer! Odd though this may sound, War and Peace is a comfort read. I reread it every year. There is nothing intellectual about this classic, despite Tolstoy’s occasional philosophising. I adore the Rostovs and the Bolkonskys (especially Masha/Mary/Marie), whether they are gossiping in the drawing room or riding horses in the confusion of battle. And what about the flight of the residents from Moscow when Napoleon and the French are at the gates? Very suspenseful! But he was right. I hate to admit it, though. At four pounds and 1,273 pages, W&P tipped over the bike every time we stopped for a break. The trick was to lean it against a tree and then lean against it bodily before it toppled. And so, quite sensibly, on the next ride I switched to the Oxford paperback, which only weighs 2.1 pounds. Recently I decided to reread War and Peace. I took it with me on a bike ride again: the Oxford. But am I losing my strength? I planned to bike to a park, choose a nice bench in the shade, and read for an hour. The problem? THE WEST WIND WAS GUSTING AT 23 MPH! I was out in the open and it was a struggle. Finally I reached the woods. I sat on a bench and the wind blew the hair across my face. I had one barrette, and though I pinned my hair back as far as possible, it kept escaping and whipping into my eye. And when I stopped for a restroom break at a convenience store, the bike tipped over. Crash! The wind, the big purse, a water bottle, a thermos of tea, and W&P. It capsized! So I sat down on the sidewalk and drank a Diet Coke. Really, I do think I’m losing my strength. Or is it just the wind? 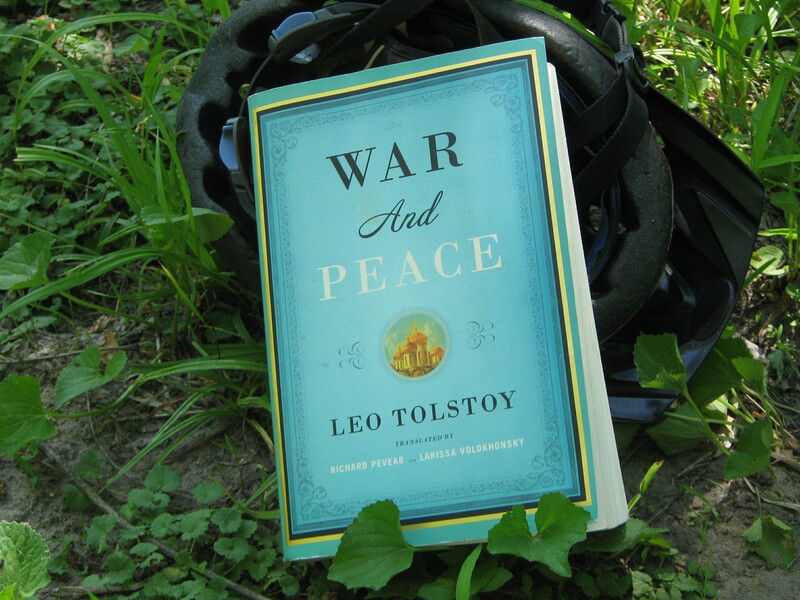 War and Peace in my bike helmet on a summer’s ride. There is a Tolstoy Renaissance this summer. How do I know? Hundreds of (probably idle) internet surfers and (possibly) Tolstoy fans have visited my posts on Anna Karenina and War and Peace. I’m not surprised. Tolstoy is the consummate entertainer. He is to some of us what Jane Austen is to the hundreds of thousands of readers who participated in the death bicentenary Lollapalooza. I fall into Tolstoy’s novels as if I am listening to a Grateful Dead song. His books are absorbing Oscar-winning movies or popcorn reads. I come up for air hundreds of pages later, concerned about Nicholas Rostov”s military exploits, or Marya Bolkonsky’s attempts to persuade her servants to move her beyond Moscow as Napoleon approaches. 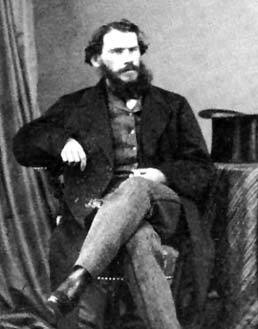 My husband holds Tolstoy responsible for my back problems. “Have you considered the e-book?” he asks when I sit down every New Year’s Day for my annual rereading of War and Peace. And so every year you will find me wilting under the weight of my huge Penguins, Oxfords, Modern Library editions, Yale, Folio Society, Vintage classics, and Heritage Press editions. And I must admit these enthusiastic posts make me laugh! My most popular W&P post is exuberant. I reread War and Peace every year. I started reading it again on New Year’s Day and just finished it a few hours ago. And now I’m ready to start again. In my favorite W&P post, “Not Quite Writing about War and Peace,” I admit that I used to identify with Pierre. When I first read WAP many years ago, I identified with Pierre, because as a young woman I talked very seriously at parties. When I read the first chapter, where poor Anna Pavlovna Scherer, a maid of honour of the empress, tries to interrupt Pierre in his earnest conversations and get him to chat more lightly with the groups, I had to laugh. And then I explain why Princess Marya Bolkonsky is now my favorite character. These days I am a little weary of Pierre, especially during the Freemason scenes. And so this reading, for the first time ever, I identify with Princess Marya Bolkonsky, who was based on Tolstoy’s mother. It’s not that she and I are alike, because that isn’t quite how fiction readers identify: it’s more that I understand why she is the way she is, and why I am the way I am. She is not socially graceful, like Tolstoy’s more sympathetic heroine, Natasha, who sings, dances, and chatters happily until she goes though a love-related depression. Marya grows up in a serious household of intellectual men, and doesn’t think about marriage, living in the country as she does. Her raging father makes her do math and practice piano every day. He intimidates her, though she loves and respects him. She is deeply religious, almost Zen (well, Christian!) in her refusal to judge others, and is also very kind to the hangers-on who live with them, like her companion, Mlle. Bourrienne. The good news: I never met a translation of Tolstoy I didn’t like. Warning: you will not understand W&P unless your edition has notes. The best translator? I agree with Mona Simpson, who said in her review of Anthony Briggs’ translation in 2006 at The Atlantic that Briggs manages to do something new but she still prefers the Maude. And yet, if it is a bilingual novel (it certainly is a novel about a bilingual culture), the previous translations don’t convey that as definitely and easily as this one does. Briggs has developed a swingy, natural way of describing how characters go from French to Russian, depending on the circumstances, and he comments on the tone of their French, using the quality of their language as another way of suggesting qualities of character. That being said, I still prefer the Maudes’ translation. But either way, Tolstoy is one of the most translation-proof writers, because his originality lies not in language (at least not for the reader in English; in all the available translations it’s fairly standard), nor in theme (he sticks to the big-ticket eternals: Life, Death, Love), but in character and in the intricacy and contrapuntal symmetry of his plots. Are you reading Tolstoy this summer? Is it going well? Any speed bumps? Not only is Tolstoy’s War and Peace dazzling and veracious, it is rambunctiously entertaining. I used to tell friends, “It’s like reading a movie.” I have read it nine times. It is my favorite novel, though Tolstoy said it was NOT a novel. It is not a novel, still less an epic poem, still less a historical chronicle. 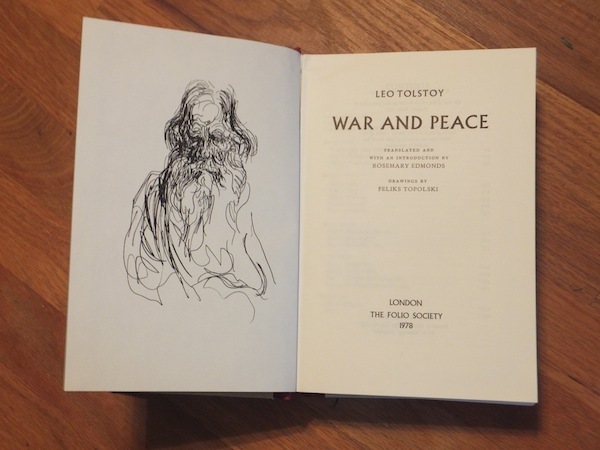 War and Peace is what the author wanted and was able to express, in the form in which it is expressed. What a cranky man! His wife Sophia put up with a great deal as she copied his books. (Read her diary.) She was so annoyed by The Kreutzer Sonata that she wrote her own version. But I love War and Peace. When I’m not reading War and Peace, I’m blogging about it: I have posted eight times about the masterpiece at Mirabile Dictu and twice at my old blog, Frisbee: A Book Journal. I mentioned it last month in a post about Balzac’s Modeste Mignon: two fathers, the cynical Prince Bolkonski (W&P) and the gentler Charles Mignon (MM), mockingly refer to the their respective daughters’ correspondence in terms of Julie d’Etanges in Rousseau’s epistolary novel, Julie, or the New Heloise. I recently acquired a used copy of a two-volume Heritage Press edition of the translation by Louise and Aylmer Maude. It was revised and annotated by the Maudes for a six-volume Limited Editions Club edition published in 1938. Then Heritage Press, the Limited Edition Club’s less fancy sister, reissued it in two volumes in 1943. The Maude is my favorite, so I love the Heritage Press edition. My Oxford paperback of the Maude translation, which has survived many readings, is full of scribbled notes and ink stains on the endpages. I do have a small collection of other reading copies: the Anthony Briggs (Penguin), the Pevear and Volokhonsky (Vintage), and the brilliant Rosemary Edmunds (a two-volume Folio Society edition, which, alas, has no notes). Many swear by Pevear and Volokhonsky, but I love the elegance of the Maude (1922-23). The Heritage Press edition is the most conveniently-organized edition of W&P I’ve seen. Their’ brilliant introduction is followed by “Notes to the Opening Chapters,” which they suggest you read before you start. Then here are footnotes on pages of the text itself, and detailed endnotes published at the end of each part ( eight parts in the first volume). There is much less thumbing back and forth. And the Maudes’ introduction is masterly. Of War and Peace it may be said that it stands at the crucial point where the modern novel begins. Its predecessors (and many of its successors) seem to belong almost to a pre-historic stage of the novel. If there can be said to be a dividing novel between the old and the modern novel Tolstoy marks it–unless indeed we take the earlier Richardson as doing so. It is illustrated by 40 ink drawings by Fritz Eichenberg and reproductions of paintings by the 19th-century artist Vassily Verestchagin. Here are some snapshots of the illustrations. So much fun to read this beautiful edition! But the game is much more fun than dating. Actual dating so often means getting stuck on a sailboat with a virtual stranger, or discovering he/she has no bookshelves. Instead of “dating,” I hung out with bookish men I met at parties, at work, or in language classes. Yes, I married one. When her friends learn Peg is going on a date with a Yale man she hasn’t seen since childhood, they humiliate her by helping her get ready. Thus it works out that getting Peg ready for her date is a group project. With a variety of emotions that includes both genuine kindness and an incredulous condescension (Peg, on a date? what will he think when he sees her, no matter what she has on? ), the three friends, her “best friends,” gather in her room; they watch and they make suggestions, helpful and otherwise. They make silly jokes. Megan and Cathy and Lavinia, all concentrated on poor Peg. Adams, who graduated from high school at 15 and Radcliffe at 19, is very smart: the preparation-for-the-date scene is a homage to a scene in Tolstoy’s War and Peace. In Tolstoy’s masterpiece, Princess Mary, a young, very kind, very plain woman who lives in the country with her severe father, is excited because a suitor, Prince Anatole, is coming to meet her. Her French companion, Mademoiselle Bourienne , and her pregnant sister-in-law, Princess Lise, help her prepare for the “date,: only to find that she actually looks worse in chic clothes and the new hairdo. Here is a passage from the Maude translation. In neither Peg’s nor Mary’s case, does the date go well. In Superior Women, the plain, red-faced Yale man, Cameron, gets drunk and almost rapes Peg, who fortunately is strong enough to shove him off her. In War and Peace, Princess Mary is very shy and stilted, but Anatole will marry her for her money. But the next day, but after finding him making out with Mademoiselle Bourienne, she turns down the proposal. Whether it is the nineteenth century or now, dating can be grueling. The War and Peace Collection: Is Rosemary Edmonds’ Translation the Best? 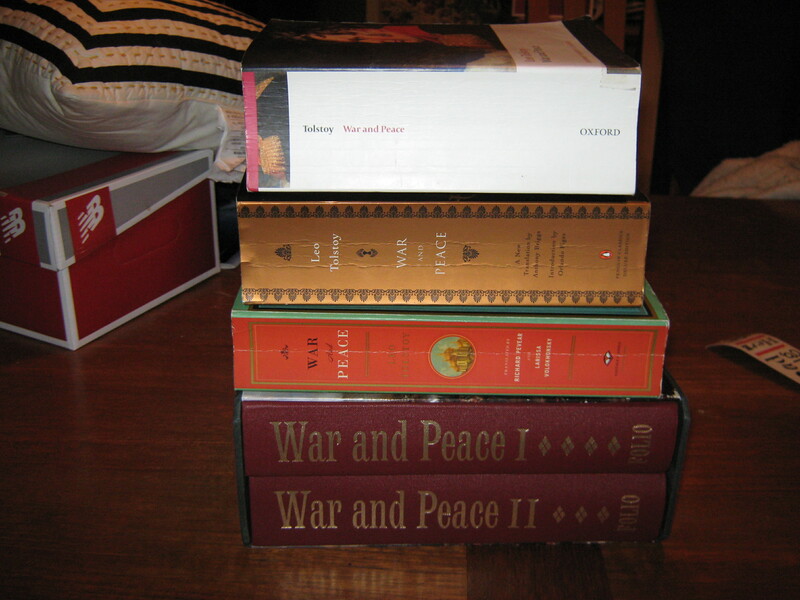 My “War and Peace” collection. Tolstoy’s brilliant, entertaining chronicle of Russia during the Napoleonic wars is a pageturner. Tolstoy said it was not a novel. Of course it is a novel, or I would not love it so much, but it also mixes in history and philosophy. Every character is vivid; every scene so realistic that I feel I live in nineteenth-century Russia. I have read five different translations, and have a collection of four on my shelves: in the photo at the top of the page, you see the Maude translation (Oxford World Classics paperback, top), the Anthony Briggs translation (brown Penguin trade edition, second from top); the Richard Pevear and Larissa Volokhonsky translation (Vintage paperback with the orange spine, third); and the Rosemary Edmonds translation (Folio Society, two-volume set). I just read the Edmonds translation for the first time. It was first published by Penguin in two volumes in 1957. I was drawn to it because it was available in two volumes. It is easier to heft one 700-page volume than one 1,400-page book. Is Rosemary Edmonds the best translator of Tolstoy? I am enraptured by her prose. Her style is simple and graceful, neither too literary nor too literal. It lies somewhere between the Edwardian elegance of the Maudes and the deliberately rough fidelity of Pevear and Volokhonsky to Tolstoy’s allegedly awkward syntax and inelegant repetitions. Edmonds is a translator who allows you to forget you are reading. You fall into the book and live there. This afternoon I was particularly moved by Denisov’s grief over the senseless death of Petya Rostov. It is the constrast between the reactions of the unfeeling officer Dolohov and the brave, kind-hearted, lisping officer Denisov that made me cry. Denisov did not reply. He rode up to Petya, dismounted, and with trembling hands turned Petya’s blood-stained, mud-bespattered face–which had already gone white–towards himself. “I always like sweet things. Wonderful raisins, take them all,” he recalled Petya’s words. And the Cossacks looked round in amazement at the sound, like the howl of a dog, which broke from Denisov as he quickly turned away, walked to the wattle fence and held on to it. Much of the action in War and Peace revolves around Moscow and Petersburg society. I love the descriptions of the balls in Moscow, the political salons in Petersburg, the hunts in the country, Natasha’s singing, the name-day parties, Nikolai’s fondness for simple army life, Pierre’s experiences with the Masons, Andre’s thoughts on God, Maria’s faithfulness and intelligence, and the orphaned Sonya’s struggles to remain true to her love for Nicholas in the face of disapproval from the Countess. The award-winning Pevear and Volokhonsky are widely considered the best Russian translators these days. In The New York Review of Books , Orlando Figes explains it is because they do not over-refine Tolstoy’s language and succeed in replicating his somewhat awkward style in English. In the English-speaking world there is a common perception, largely due to Garnett’s translations, that Tolstoy’s style is classically simple and elegant. This is only partly true. Tolstoy writes with extraordinary clarity. No other writer can recreate emotions and experience with such precision and economy. His moral lexicon is penetrating and direct, without the nuances and ambiguities that make Pushkin so complex, and in this respect Tolstoy’s writing is relatively easy to translate (“goes straight into English, without any trouble,” Garnett said ). But there are other elements of Tolstoy’s literary style, in War and Peace in particular, awkward bumps and angularities that have been ironed out, not just in Garnett’s translation, but in most of the subsequent translations of this masterpiece. Which is your favorite translation? Constance Garnett? The Maudes? Anthony Briggs? Pevear and Volokhonsky? And does the translation really matter? New Year’s Day puts the “e” in ennui. While your husband watches TV, you peruse a Top Book of 2014 chosen by a critic whose taste doesn’t coincide with yours. On New Year’s Day, Radio 4 in the UK will broadcast a 10-hour dramatisation of Tolstoy’s War and Peace, starring Simon Russell Beale, Lesley Manville and John Hurt. There will be interruptions for news breaks and The Archers. You can listen to War and Peace at the Radio 4 website. One small problem: the time difference. 9 a.m. in the UK is 3 a.m. here. It doesn’t seem likely I will be up at 3, does it? But I will be up at 9 a.m., or, err, 3 p.m. there. I reread War and Peace this year and loved it. I am very much looking forward to the dramatization on New Year’s Day. The Washington Post Book World has announced its Top 10 Books of the Year. Goodreads has announced the Goodreads Choice Awards of 2014 (most of these are on the lighter, poppier side). It is the 40th anniversary of the publication of Shardik, the second novel of Richard Adams, who is best known for Watership Down. 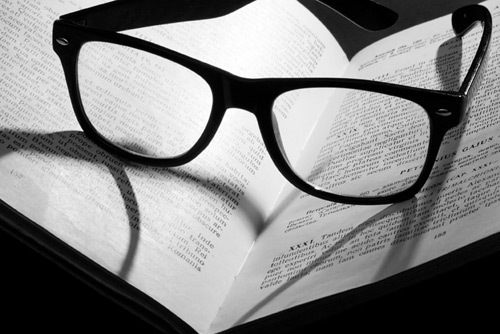 Times Higher Education has published an article on novels about campus life. There are days when I goof around. I deleted the email feature from my Nook tablet. And I also closed my Twitter account. I have a little more time now: maybe an hour a day. It was gray and gloomy and rainy today. A good day to go online, you might say. I took a walk, until it began to pour. Then, drenched and drinking tea at home, I read. I am absorbed in War and Peace, which I reread last spring: you cannot read it too often. I have so many translations on my Nook that I can switch from one to the other if the language becomes a little awkward. This time I am reading the Pevear-Volokhonsky translation. I read for pleasure, obviously, and know Russian culture only from novels, but one doesn’t think about War and Peace as Russian, once one grasps that the upper classes often speak French. in other ways it seems very 19th-century European. I know the book so well that I can skip scenes, concentrating on one set of characters or another, though I usually read straight through. It is very hard to put this down. I prefer the peace scenes. War and Peace in my bicycle helmet one summer! Her brother, Prince Andrei, a discontented man married to a woman he doesn’t respect, comes home to Bald Hills before the war to say good-bye and to leave his pregnant wife, Lise, with the family. He sneers at Lise, and practical, generous Marya points out that we all have little weaknesses, and that Lise grew up in society, so expects a social life unavailable in the country. He also detests Mademoiselle Bourrienne, her companion. Marya’s long laudation of Mlle., and his short response, a defense of his sister who is so devoted to her cruel father, are characteristic of them. “Well, but in truth, Marie, I wonder if father’s character isn’t sometimes hard on you?” Prince Andrei asked suddenly. Prince Andrei is right about her father, but she will not see it. And Mademoiselle Bourienne is disloyal to Marya, as we see later: she makes out with Prince Anatole, the man who has come to Bald HIlls to propose to Marya, and Marya catches them. Fascinating characters, and it is very much a character- and plot-oriented book. It is so difficult to explain why one loves a classic, and War and Peace is simply too big to do justice to unless one breaks it down. But I do love reading it. I simply can’t write about it.